Nocatee is the 3rd fastest selling community in the United States, and its real estate market reflects that. There are so many Nocatee real estate options. This colorful map gives you a nice lay of the land. What people love about Nocatee is the range in price points and the variety of builders out there. You can find a well-appointed home for sale in Nocatee that fits your lifestyle at a price that fits your budget. The developers of Nocatee have done an incredible job in selling the lifestyle of trails and pools, and the area is well thought out. The best place to go to find out about Nocatee is the Nocatee website. It has up to date information on new neighborhood releases. The Nocatee website also has a really great Blog. You’ll find everything from 55-plus neighborhoods like Del Webb and Artisan Lakes to cottage homes starting in the $300s in Twenty Mile Village, and Coastal Oaks. There are numerous midpoint ranges, and custom builders Glenn Leyton and Pineapple Corporation are now building luxury homes in Twenty Mile’s The Hammock and The Vista. 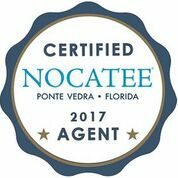 Buyers and residents we have talked to love the Nocatee lifestyle pointing to the friendliness of neighbors, the Nocatee water park, the farmer’s market, and great schools. There is a jam-packed event calendar that seriously has something for everyone. Food Truck Fridays are a blast, and there are some regular concerts. Plus there is a club for just about everyone. They’ve done a great job of creating opportunities to make newcomers feel welcome. The Nocatee Town Center continues to attract new businesses. Some of the latest additions are Mshack, Big Fish Yoga, and Pieology. If you are considering moving to Nocatee, give us a call. We’d be happy to introduce you to some people who have recently purchased a home there. They can give you the insider’s perspective on the communities. © 2019 Northeast Florida Multiple Listing Service, Inc. All rights reserved. The data relating to real estate for sale on this web site comes in part from the Internet Data Exchange (IDX) program of the Northeast Florida Multiple Listing Service, Inc. Real estate listings held by brokerage firms other than Young & Volen | Ponte Vedra Club Realty are marked with the listing broker’s name and detailed information about such listings includes the name of the listing brokers. Data provided is deemed reliable but is not guaranteed. Data last updated 2019-04-19T12:24:59.917.